The 2010 Mussels of the Month. The December 2010 Mussel of the Month is Truncilla truncata. Truncilla is a genus of four species occurring in North America from the Great Lakes south to Nuevo Leon, Mexico. Truncilla is an interesting genus with which to close-out 2010 (or any year, for that matter). It is one of the many genera of lampsiline unionids, but has consistently been recovered among the basal members of that clade (with Obliquaria, Ptychobranchus, etc. ; Graf & Cummings, 2006). One of the more intriguing angles from which Truncilla has been studied is the way that males package their sperm. Waller & Lasee (1997) provided a nice description of the spermatozeugmata (or "sperm balls") of T. truncata. Spermatozeugmata are clusters of thousands of sperm, the heads of the individual spermatozoa imbedded in an acellular gelatinous matrix. This mechanism perhaps reduces the dilution of the sperm while they are in transit between the mantle cavities of the male and female (Cummings & Graf, 2009). Spermatozeugmata are not unique to Truncilla, having been observed in a variety of genera (e.g., Edgar, 1965; Lynn, 1994; Ishibashi et al., 2000). There is a great image and video of anodontine spermatozeugmata on the Unio Gallery web site. The November 2010 Mussel of the Month is Megalonaias nervosa. Megalonaias is a widespread genus of two species that occurs from the Interior Basin of North American south to Nicaragua. Megalonaias is worth discussing for a couple of reasons. For one, it is one of the few amblemine genera found widely in both North and Central America. It is interesting to speculate where it arose. In the north, and then spread south? Or, vice versa? We suspect that Megalonaias represents a tropical lineage that has spread north, and this leads to the second reason Megalonaias is interesting. It was Megalonaias nervosa that refined our understanding of freshwater mussel brooding patterns. With the early ecological observations of freshwater mussels and the efforts to propagte these mussels in full swing aroung the turn of the 20th century, it was determined that different groups of mussels have different reproductive periods. Whereas mussels like Amblema and Elliptio spawn in the spring and brood their larve during the summer, other taxa like Lampsilis and Pyganodon release gametes in the fall and brood their larvae over the winter. The obvious names for these two different life histories was "summer breeders" and "winter breeders," respectively. Megalonaias nervosa, however, was the exception to this pattern. Based upon its taxonomic affinities, M. nervosa was expected to be a summer breeder, but it was known to be gravid during the fall and winter. What makes Megalonaias different from other winter breeders is the duration that it broods its larvae. Rather than brooding its larvae for several months (a long time) like typical winter breeders, M. nervosa carries its glochidia for only a couple months (a short time), as observed in summer breeders. Thus, the more accurate descriptor for the two broodering periods is short- and long-term brooders. Or, tachytictic and bradytictic, respectively, if you want to get fancy. The late season, tachytictic brooding period for Megalonaias is what makes us hypothesize a tropical origin for Megalonaias. Perhaps it is adapted to a warmer climate better suited to reproducing late in the year...? 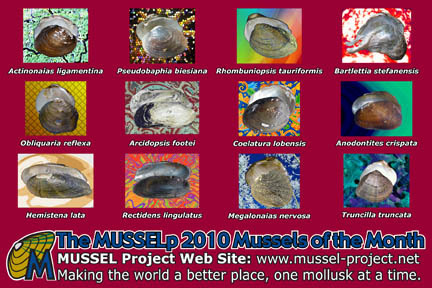 The October 2010 Mussel of the Month is Rectidens lingulatus. Recidens is a genus of two species endemic to the Sunda Islands of Indonesia. What to say about the freshwater mussel Rectidens? It is another one of those taxa for which a google search returns a bunch of sources that merely notice its existence. We already knew that from the global reviews of Simpson (1900, 1914), Haas (1969) and Graf & Cummings (2007). R. lingulatus is restricted to Borneo. The September 2010 Mussel of the Month is Hemistena lata. Hemistena is a monotypic genus endemic to the Ohio Basin in North America. Hemistena lata is federally endangered in the United States. The species is endemic to the Ohio Basin, including the Tennessee and Cumberland rivers. Williams et al. (2008) provided a nice summary of the current state of our knowledge of this rare species, and we don't have anything to add beyond that. The August 2010 Mussel of the Month is Anodontites crispata. Anodontites is a diverse genus of 21 species, widespread in Meso- and South America. Last month, we featured Coelatura as an Afrotropical "garbage-pile" genus. The August 2010 Mussel of the Month crosses the Atlantic to highlight the type species of a Neotropical genus of comparable stature. It would come as no surprise to us if Anodontites proved paraphyletic. Nor would we eat our hats if this conchologically variable assemblage of species actually turned out to represent a clade. A key difference between Coelatura and Anodontites --besides the fact that they belong to different families and are endemic to different continents -- is the amount of malacological attention the various species have received. Relative to many other tropical taxa, Anodontites has been well studied with regard to soft-anatomy, life history, larval morphology, and ecology. An excellent gateway into that literature is the marvelous bibliography provided by Simone (2006). 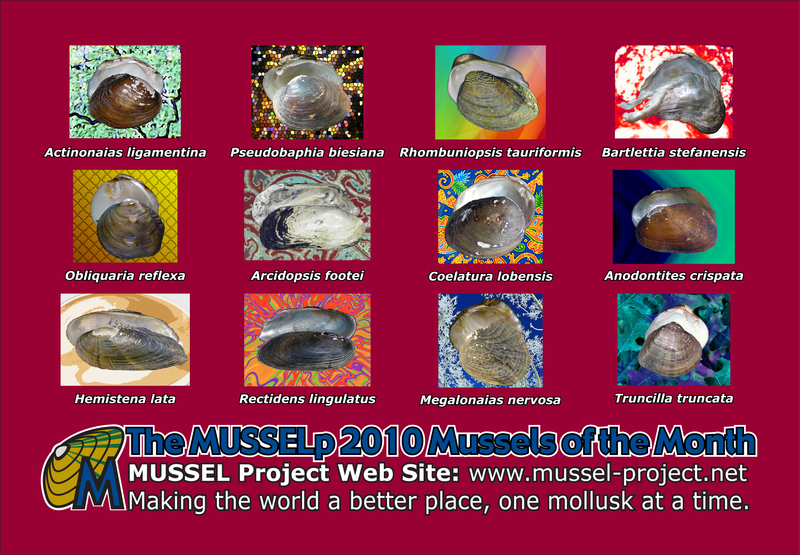 The June 2010 Mussel of the Month is Arcidopsis footei. Arcidopsis is a monotypic genus endemic to the West Ghats of India. We have very little to say about Arcidopsis footei. A GoogleScolar search returns only our global checklist (Graf & Cummings, 2007). All that most have done before us is notice that this mussel exists, so we are going to leave it at that, too. There have been a couple recent works on Indian mussels that show some pictures (Subba Rao, 1989; Ramakrishna & Dey, 2007). The May 2010 Mussel of the Month is Obliquaria reflexa. Obliquaria is a monotypic genus from eastern North America. What to say about Obliquaria reflexa? The species is widespread, occurring throughout the interior basin (including the Great Lakes) as well as other basins draining to the Gulf of Mexico from Georgia west to Texas. Mostly the species is interesting for its morphological characters and what they tell us about freshwater mussel evolution. Based upon the anatomy of the ctenidial demibranchs with which females brood, O. reflexa is a lampsiline, but it is an odd one. Rather than the marsupium being confined to only a posterior portion of the outer demibranchs, larvae are held in the water-tubes near the middle. Obliquaria is also an oddity among lampsiline mussels for its scuptured shell bearing a single row of nodules down each side. In general, O. reflexa is usually recovered as one of the more basal lampsiliens (Graf & Cummings, 2006), along with other genera like Cyprogenia and Ptychobranchus. Whether the marsupial morphology seen in more typical lampsilines (e.g., Lampsilis, Villosa, Actinonaias) is the ancestral condition of the Lampsilini or if the oddities of the basal genera represents a state in transition from other amblemines remains to be fully explored. The April 2010 Mussel of the Month is Bartlettia stefanensis. Bartlettia is a monotypic genus widespread in both the Amazon and Parana basins of South America. Bartlettia is a problematic taxon from a taxonomic perspective. During the first part of the 20th century, it was placed among the Etheriidae (Thiele, 1934; Pain & Woodward, 1961). But then it was argued that Bartlettia is merely a deformed mycetopodid (Parodiz & Bonetto, 1963). However, one could argue that those pre-cladistic hypotheses are not all that helpful. After all, while the consensus today might be that we want to recognize only monophyletic taxa, that was not always the goal. So, what do modern, cladistic analyses have to say about the phylogenetic position of Bartlettia? Almost nothing. Bartlettia has yet to be included in a formal analysis (i.e., explicit matrix, alternative hypotheses being compared via some optimality criterion, etc.) of either morphology or DNA. Furthermore, the phylogenetic position/validity of the Etheriidae generally is even disputed (Bogan & Hoeh, 2001; Graf & Cummings, 2006, 2010; Hoeh et al. 2009). Mansur & da Silva (1990) drew a cladogram of etheriid relationships, and they retained Bartlettia in that family. So do we... for now. Bartlettia is the perfect mussel for April because KSC's birthday is in April and both of them are enigmas. The March 2010 Mussel of the Month is Rhombuniopsis tauriformis. Rhombuniopsis is a genus of three species from southern China. Rhombuniopsis is another one of those genera about which we know very little. Google it, and you are likely to first run across this page -- as well as all the taxonomic dictionaries that have pulled the name from various lists. The most detailed assessment of the species of this genus was probably that of Moskvicheva & Starobogatov (1973). It is somewhat unclear where this genus goes in the classification of freshwater mussels. Most western authorities have placed Rhombuniopsis among the amblemine mussels following Haas (1969). However, the Russians — well known for their divergent opinions regarding freshwater mussels systematics — have generally placed Rhombuniopsis close to Unio (Tribe Unionini) (Starobogatov, 1970; Korniushin, 1998). In our global checklist, we followed the latter arrangement (Graf & Cummings, 2007), but we look forward to a modern appraisal of the data. The February 2010 Mussel of the Month is Pseudobaphia biesiana. Pseudobaphia is a genus of two species known only from China (and that is about the extent of our knowledge). Pseudobaphia is another one of those genera for which almost nothing is known — except that it exists. Google returns a number of taxonomic databases that are able to confirm that there is a unionid genus by this name, although Google also suggests that we might be seeking the plant Pseudobahia (it looks like a daisy). Queries to GoogleScholar and the Zoological Record return only 6 references: Simpson (1900), Modell (1942), Haas (1969), Vermeij & Dudley (1985), Prozorova et al. (2005), and our global checklist (Graf & Cummings, 2007). GoogleBooks returns a few more. Prozorova et al. (2005) reported on this genus (although a different species than the one we figure here) in their paper on Yangtze mussels. That article is in Russian and only provides distributional data.The time is ripe to figure out where Pseudobaphia goes phylogenetically. The January 2010 Mussel of the Month is Actinonaias ligamentina. As the taxonomy currently stands, Actinonaias is a New World genus of nine species — mostly from Mexico. Like so many genera of the Unionidae, Actinonaias is either an interesting biogeographical anomaly or (more likely) a frustrating example of a taxonomic arrangement that has out-lived its usefulness. Or not. Rather than being a biology problem, a quick review of the history suggests an alternative. Ortmann (1912) was the first to pull A. ligamentina and the other species now in Actinonaias from Simpson's (1900, 1914) broad concept of Lampsilis. However, at the time, Ortmann (1912) used the name Nephronaias for these species, as well as a number of other Mesoamerican taxa. Eventually, it was revealed that Nephronaias consisted of both species with fancy lampsiline marsupia and species without. Those without remained in the genus Nephronaias, and the lampsiline species were united in the genus Actinonaias (Ortmann, 1919; Ortmann & Walker, 1922). At the time, that shift led to an improvement in freshwater mussel taxonomy. Ortmann (the last genius to study mussels) used his vast knowledge of the soft-anatomy of these mollusks to take us beyond a mostly conchology-based system. Not long after Ortmann's contribution to the problem, Frierson (1927) recognized the disjunction described above. He proposed taking Ortmann's generic splitting further by creating the genus Ortmanniana for ligamentina, but he also included the taxa that we now recognize as Lampsilis higginsi and L. abrupta. Frierson's (1927; Haas, 1969) concept of Ortmanniana was subsequently abandoned, and the Nearctic species of Actinonaias fell back in with the Mesoamerican species, and thus our current generic concept with 9 species. It's all a rich tapestry. The type of Actinonaias (Unio sapotalensis Lea, 1841) resides among the Mesoamerican assemblage. Fortunately, if future phylogenetic work results in the need for the Nearctic species (i.e., A. ligamentina and A. pectorosa) to be removed to their own genus, Ortmanniana is available. 2010 MUSSELp Mussels of the Month Postcard.